Just why did these moderately talented, averaging-looking dudes get the golden ticket to tweener stardom? Because of that venerable Disney star factory that birthed other moneymaker stars and new matinee idols, Zac Efron and Miley Cirus. Having established themselves with the Disney Channel TV movie Camp Rock and sold themselves on the teen-rag circuit over the past two years, the Jonas Brothers make their big screen debut with this glossy 3-D slice of Disney propaganda. For Jonas newbies, the brothers are Joe, the straight-haired lead singer dressed like Tom Cruise from Cocktail, and Kevin and Nick, the two curly hair guitarists whom I couldn't tell apart. They are a straight-ahead pop rock band that, instead of synchronized dancing, play their instruments and channel stage antics like advanced players of Rock Band. To heighten the attention of the girls they can also spin, jump and do tumbles and somersaults around the stage like seasoned acrobats. 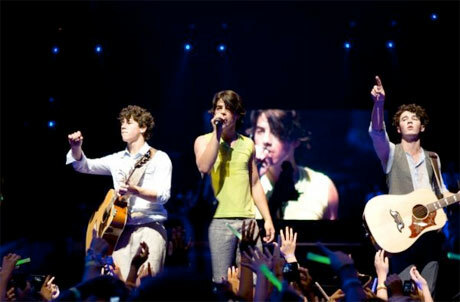 Like the Miley Cirus 3-D concert film, the Jonas Brothers are trotted out with maximum exploitation. In addition to a well-produced stadium concert with the big hits belted out, manufactured, "candid" behind-the-scenes footage show the trio revelling in the insane fandom that Disney has created for them. The theatrical experience of this film is made even more interactive than the kitschy 3-D process. Sitting in an audience of die-hard tweeners who know the words to every song and scream their lungs out whenever Joe Jonas points to the camera is strangely exhilarating. While it's just the latest boy band fad, for this audience it's a seminal event in their young lives. How can you not be fascinated with that? The first few songs are a struggle to get through — barely hummable pop songs sung with the Brothers' newly broken, squeaky voices. But as the girls screamed their way through these songs, I realized this film is critic-proof, and with ego in check, I let myself go along for the ride. As the show progresses, the catchiness of the tunes eventually sets in. Well-timed guest performers such as Demi Lavato break the monotony and add a refreshing female perspective. The film reaches its creative high when pop star Taylor Swift (apparently a former girlfriend of Joe Jonas) joins the trio for a song. Far and away a better singer than all the brothers combined, Swift's country pop rock crossover is a fine foot-tapping cap to the show.